I. Is Scientology a Religion? II. Who Are the Scientologists? III. How Do Scientologists Validate Their Creeds? 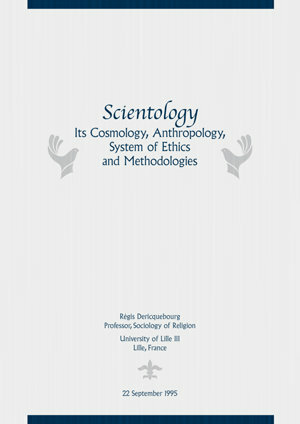 In this article, originally published in 1999, Professor Régis Dericquebourg affirmatively answers the question “Is Scientology a Religion?” through a systematic examination of its cosmology, theology, anthropology, system of ethics, ceremonies, organization, creeds and membership requirements: “Scientology,” Dr. Dericquebourg concludes, “has the characteristics of a religion. It has a theology, a set of exercises making it possible to reach the spiritual part in every human being, a ‘very bureaucratized’ church structure, and religious rites.… Scientology is born in a modern context. It gets from it certain elements (technicity, well-asserted methodical approach, importance of communication, well-being, understanding of organization, personal experience) which it has mixed with ancient spiritualistic traditions. L. Ron Hubbard and Scientologists extend the use of instruments of rationality in the service of a mystical path, a self-transformation and a transformation of the world. It is probably for that reason that it appears unique among the religions.” Indeed, Scientology is a religion born in the modern age, offering the mental and spiritual technologies of L. Ron Hubbard for the benefit of its parishioners—in addition to the global social betterment and humanitarian programs sponsored by the Church of Scientology for the benefit of humanity. Régis Dericquebourg, Ph.D., recently retired from the University of Lille III (Lille, France) and is now associate professor at the Faculty for Comparative Studies of Religion and Humanism (FVG) in Wilrijk, Antwerp (Belgium). He holds a degree in psychology from the University of Paris and a doctorate in sociology from the University of Sorbonne and has worked with the National Center of Scientific Research. Since 1972, Professor Dericquebourg has devoted himself to the study of minority religions, a project he began by spending three years with the Jehovah’s Witnesses as an observer. He has published prolifically in both French and English. His books include Healing Religions (1988); The Antoinists (1993); The Christian Scientists (1999); and To Believe and Heal (2001).